【動物, 動物学】 アカギツネ (cf. silver fox). 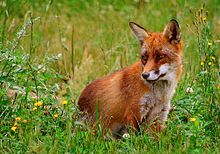 A common species of fox, Vulpes vulpes native to North America, Asia, Europe and North Africa; small, with reddish fur, but larger than the arctic fox. A flowering plant, Celosia argentea, having brightly coloured flowers of several shades. Vulpes vulpes on Wikimedia Commons. Celosia argentea on Wikimedia Commons.